Christmas in Venezuela is one of the most important times of the year. While it is always a special time in South America, it is especially a very important holiday in Venezuela. Christmas is nearly a month-long event. Many people begin celebrating with Santa Barbara's Day on December 4th. On December 16th families bring out their pesebre, an elaborate depiction of the nativity scene. The height of Christmas celebrations begin December 21st and continue until Christmas Day. There are nine carol services for Christmas and Venezuelans attend at least one of these masses to worship at dawn. From the large city of Caracas to the smaller rural areas, people rise in the early mornings and travel by foot as most roads are closed off. No alarm clocks are needed as the sound bells and firecrackers fill the early morning air to let everyone know it is time. The final service is on Christmas Eve or Nochebuena de Navidad. A very important mass, families return home afterward for a large meal and to exchange presents. In some families, Christmas Eve is the most important day; certainly, children think so as it is when they open presents. On Christmas Day families attend Misa de Gallo or Mass of the Rooster. It was given this odd name because of its 5 a.m. calling time. Then many take to the streets for Christmas celebrations and to visit family and friends. Food always plays an important role in South American holidays and Venezuelan food plays an important role in the Christmas tradition. The single most important dish is the hallacas, also known as tamales in other areas. 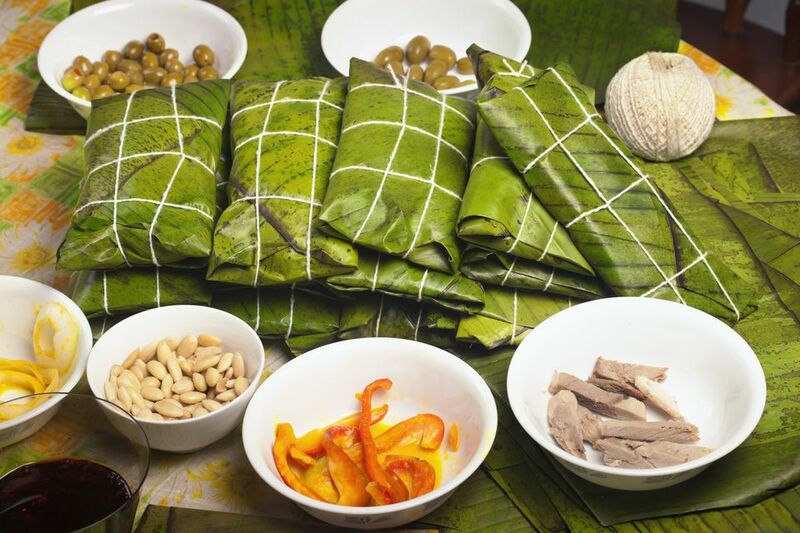 A balance of savory and sweetness, hallacas are traditional Venezuelan meat pies with a cornmeal crust that are wrapped in banana leaves and boiled for a couple of hours. Fillings include meat with raisins, olives, green and red peppers, capers, and pickled vegetables. Hallacas are only eaten at Christmas because they take so long to make and often require the entire family pitching in on the cooking. But they are also important outside the home as they are given to friends and neighbors in a friendly competition. Many will boast that their mother or grandmother makes the best hallaca in the neighborhood or even the country. Traditional Venezuelan decorations are found in all homes with the most important being the pecebre or nativity scene which depicts Baby Jesus in the manger. Some families are much more elaborate in their decorations and create an entire diorama featuring the region. This piece is often passed down from generation to generation and considered a very special part of Christmas. Today, modern decorations may also appear and some homes now have an artificial Christmas tree complete with snow. Unlike the tradition of Santa Claus, in Venezuela, children receive presents from Baby Jesus and occasionally St.
Nicholas. While at one time presents were put next to the pecebre, it is becoming more common for them to be placed under the tree. Most homes are decorated with bright lights. The home plays an important role and many people paint their homes a month before Christmas to prepare for the festivities and to set the tone for the new year. One of the unique elements to Christmas in Venezuela are the gaitas, traditional Christmas songs that combine a Latin culture with African influence. It is common for people to refer to a gaitero rhythm which reflects the joy of the season. It is very common to hear this traditional music all throughout Venezuela during the holidays.